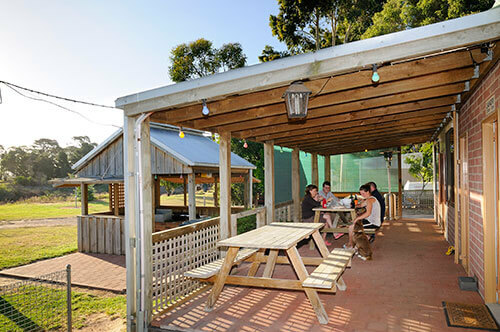 As a starting point to visit the Gippsland Lakes, investigate the nearby Victorian alpine high country, Ninety Mile Beach, cycle the Gippsland Rail Trail or even just as a convenient stop off on the way to or from Melbourne, we welcome all visitors to our Tourist Park. The amenities are immaculately clean, heated and enhanced by a well- appointed camp-kitchen complete with television, microwave, fridge and heater which adds warmth in the cooler evenings and laundry facilities. The undercover barbecue and eating area together with a number of open fireplaces make wonderful meeting areas and a playground for younger children is sited close at hand. Picnic tables are readily available for campers to enjoy a meal and socialize while keeping an eye on children at play. For the marginally more energetic, Apex Park is a short walk away and offers an array of play equipment, a BMX track and access to the Gippsland Rail Trail. Visitors may also access the adjoining council swimming pool when open. There is also a V-line Train that travels daily to & from Melbourne & we are walking distance from the train station – so when staying with us you can utilise this service & spend a day in Melbourne. We are just a 5 minute stroll from the town centre, offering the all the delights of a small town which includes the local bakery, butchers, café’s, gift shops, gallery, Courthouse Theatre, pub and the exotic Turkish Magic. Go for a drive to the Mitchell River National Park and walk the Den of Nargun (part of the Bataluk Cultural Trail). Visit our local award winning restaurants & wineries to experience the best of what Gippsland has to offer from local producers. Come by Train & bring your bike – ride the Rail Trail. Read a book, sit back for the day or a couple of hours & enjoy the setting – Relax. Our stay for 2 nights this past weekend was our first adventure trying out our new van. We had chosen Stratford as it's only 60ks from home, and a nice easy drive to begin with. We were pleasantly surprised with the amenities available, including the camp kitchen and BBQ area. The park grounds are very well kept and tidy. the toilets and ablutions block very clean. I imagine the adjoining pool would be a bonus for families staying in the warmer months. We were allocated site 23 at the end of the road and overlooking the river. This was a peaceful and relaxing site which I would have no hesitation in recommending. The owners were very friendly and helpful. I wanted to let you know we had the pleasure to have stayed at the above caravan park. Our hosts were extremely friendly and the park very clean and inviting and well laid out. We enjoyed our stay so much we originally booked for two nights and stayed for 5 nights. We are definitely going back and taking our best friends who are also members of Top Parks. The owners deserve a pat on the back or some recognition for the effort they put in to the park. The cabin had everything we needed, was very well priced and was so lovely and clean, as was the whole park and we really enjoyed making your caravan park the base for our sightseeing. So a big thank you for your hard work and effort that goes into running the park to provide such great quality accommodation. We stayed for one night with a nav, loved the hedge in between sites. Really set up camp kitchen also.